Previously, the international variant of the Samsung Galaxy S4 Active got leaked in a variety of pictures and this time @evleaks has leaked the AT&T variant of the dust and water-proof device. 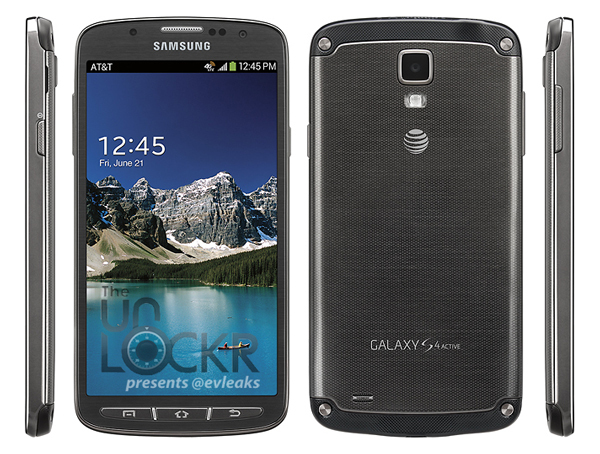 The Galaxy S4 Active is yet to be officially announced by Samsung itself. We think the Korean giant will unveil the device, along with the Galaxy S4 Zoom and Galaxy S4 Mini, at their Premier 2013 event on June 20 in London. The water and dust-proof Galaxy S4 Active will pack a Qualcomm Snapdragon 600 CPU clocked at 1.9GHz, Adreno 320 GPU, 2GB of RAM, 8 Megapixel rear facing camera and a 2.1 Megapixel front facing camera, both sensors are capable of shooting 1080p videos at 30 FPS. The device will feature a 5-inch Full HD (1080p) Super AMOLED display, 16GB of internal storage with a MicroSD slot for storage expansion, Bluetooth 4.0 + LE, Wi-Fi 802.11ac, NFC, IR Blaster and a 2600 mAh battery. The device will have LTE support as well. The device will have Android 4.2.2 (Jelly Bean) with Samsung’s TouchWiz Nature UX out of the box. Internally, The Galaxy S4 Active is exactly the same as any other Samsung Galaxy S4, except the camera sensor difference, but externally it’s a very tough device. 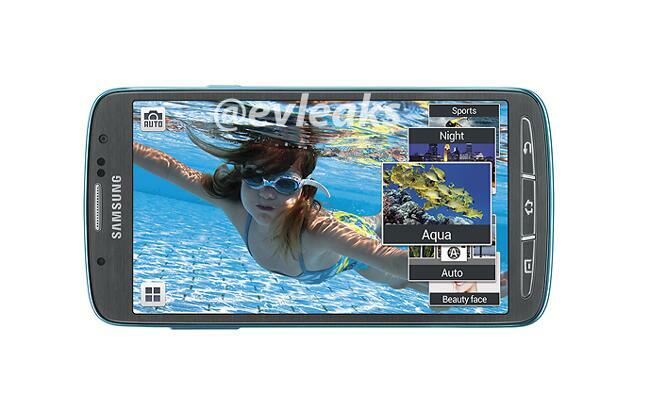 [email protected] has posted another image that confirms an Aqua mode in the camera modes of the Galaxy S4 Active. Oh god, please don’t let this be the design for the Note 3… Those solid buttons O_O I was so glad to have only one button on the SGS3 after my HTC HD2..
hmm i wonder how waterproof could be justified with those speaker holes at the back and the camera and back cover crease? might be water-resistant but not waterproof. S4 Active design is better than the S4 (android). Im fan of Note Series. Im waiting for Note3, but i hope they make an better design like this, becouse im boring. Much better design than the standard GS4. Build is metal since it’s water/dust proof. Now this one is hot, but it will also have the DAC from Qualcomm. Which means also problems and crackling with other earphones/headphones. or not???? Anyone any idea?? ?